Half diamond eternity ring set with a mixture of white princess cut diamonds and blue baguette cut sapphires across a 3.5mm design. 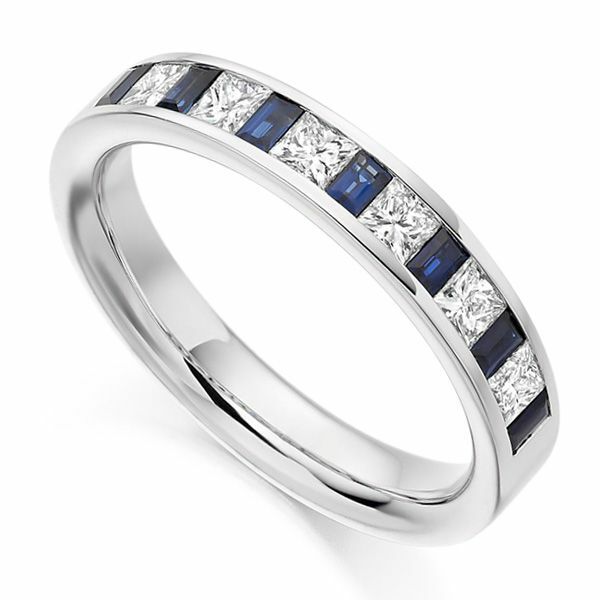 Celebrate your love with this extraordinary blue Sapphire and white Diamond Eternity Ring. Set with 0.56cts carats of Princess cut Diamonds, each sparkling white Diamond alternates with 0.35cts of deep blue Sapphires. Both colours contrast with perfection within a 3.5mm wide band, crafted with a comfort fit. With over 0.90cts of gemstone weight, this precious Diamond Eternity Ring is perfect for your celebration. We craft each commission to order, beautifully presenting the final ring in pristine packaging, hand-delivered to your door worldwide.